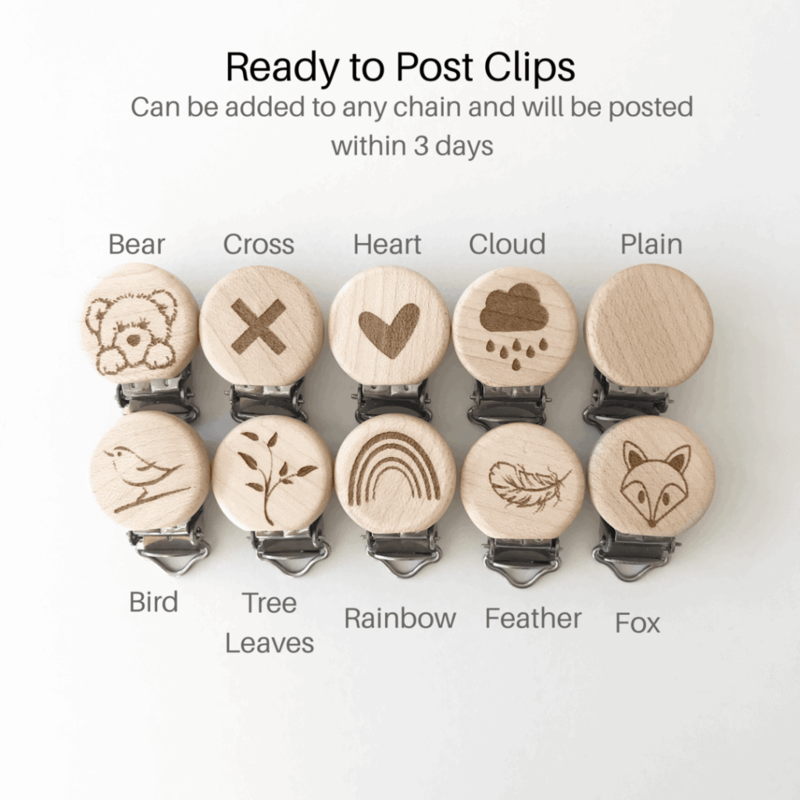 Please type the name or word to personalize your clip with if this is the style you chose. 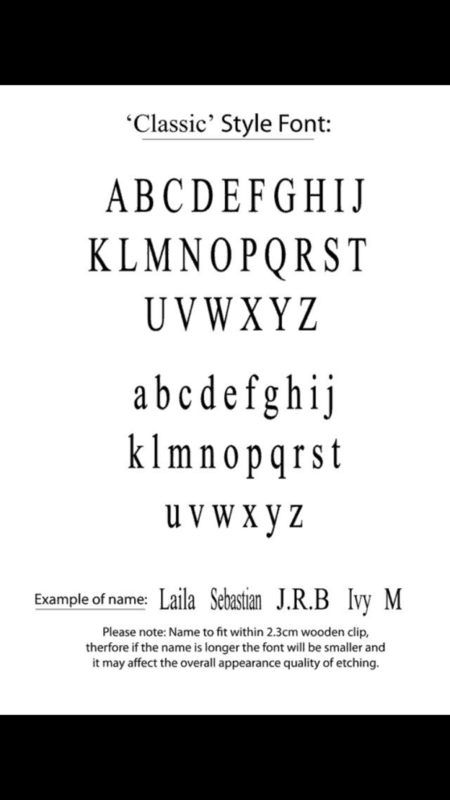 This cannot be more than 7 letters long. 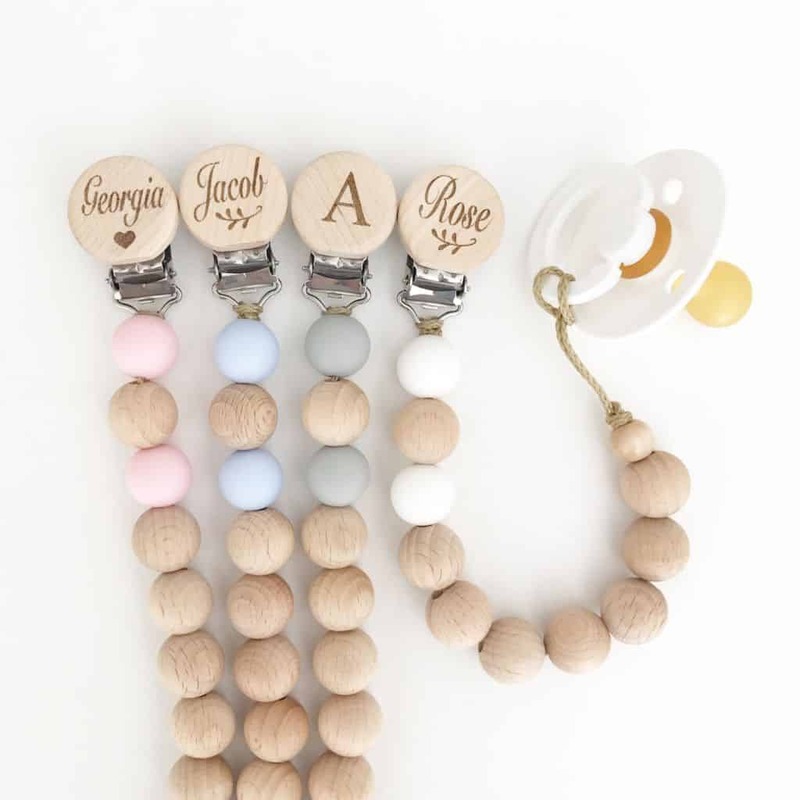 All of our personalised dummy chains have been laboratory tested to ensure they are safe for your baby. Our completed dummy clips and completed dummy chains have passed the strict testing and have passed. So you can feel confident knowing you are purchasing a safe dummy chain from us. 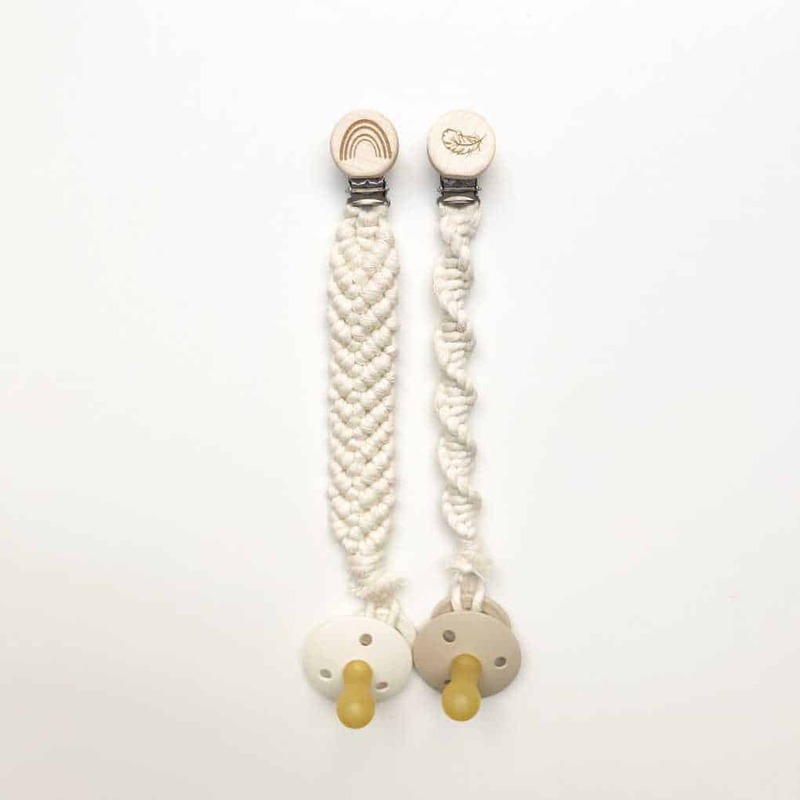 Also, our dummy chains are hand made in Australia, by myself and other mums. 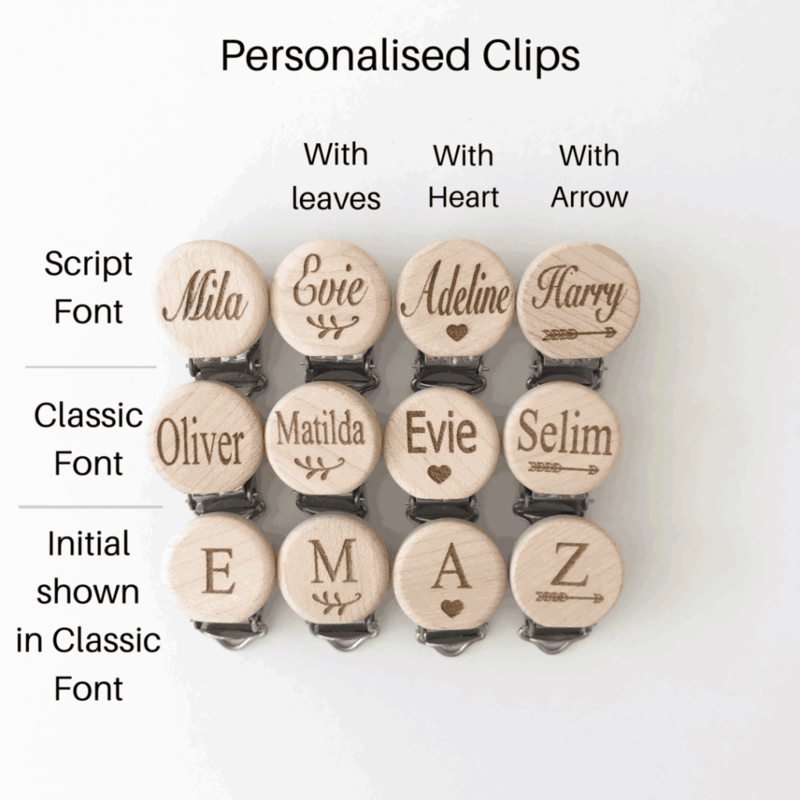 Your wooden dummy clip can be personalised with your baby name or may also be left plain. 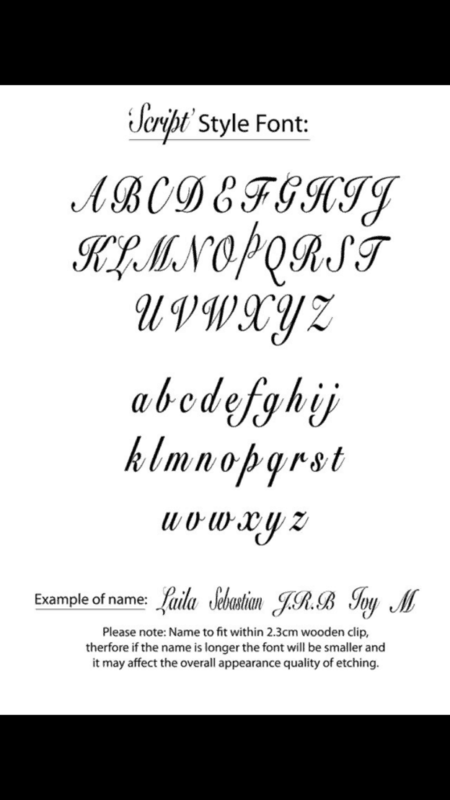 Or maybe you’d prefer one of our ‘ready to post designs’ to it. 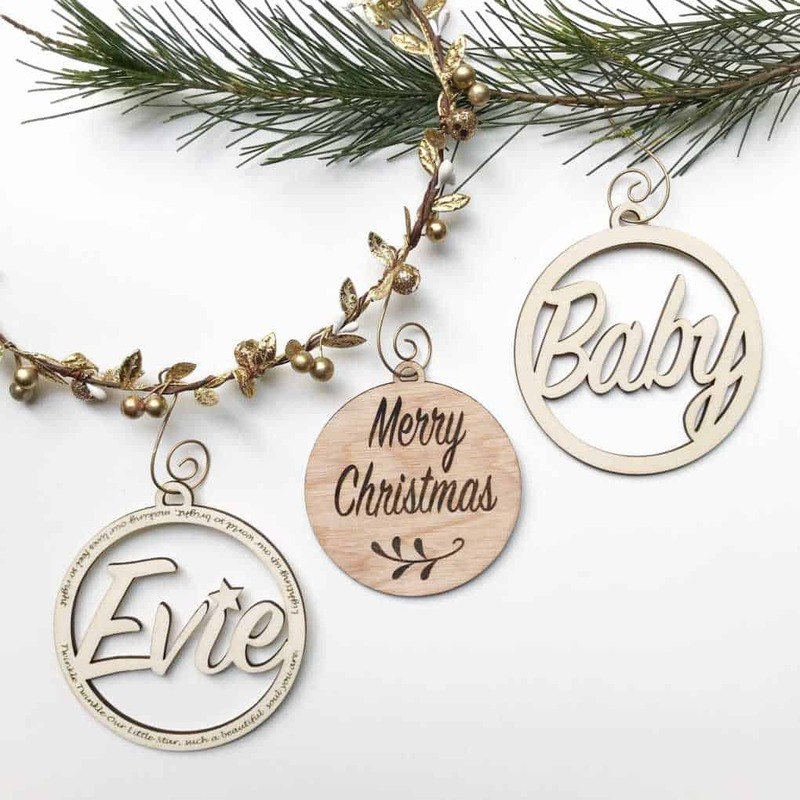 Therefore, making this newborn baby essential the perfect baby gift. 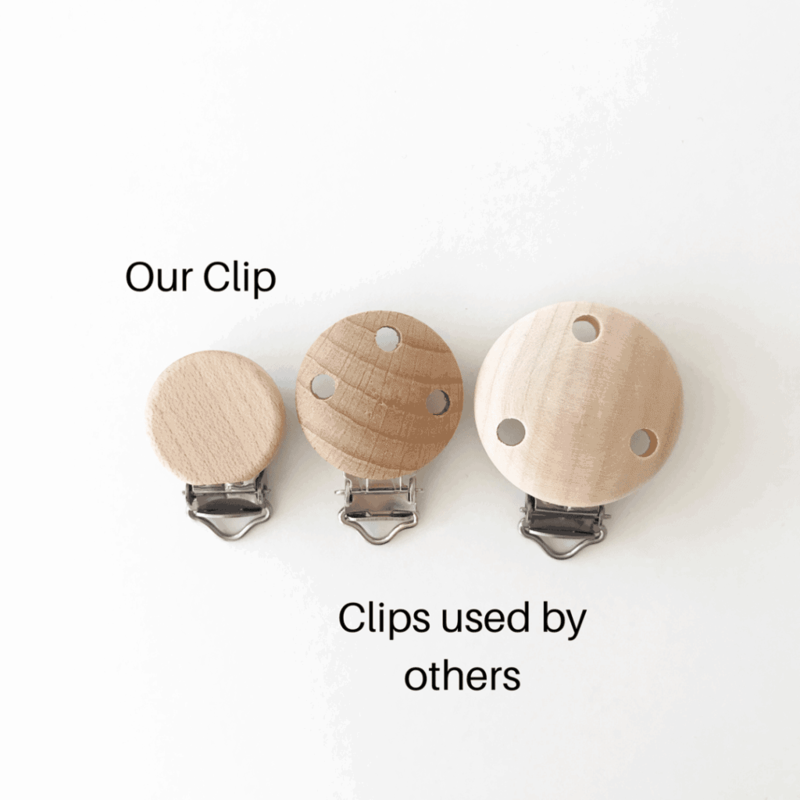 Our bead dummy clips are handmade in two styles – Chunky Beads or Petite Beads. 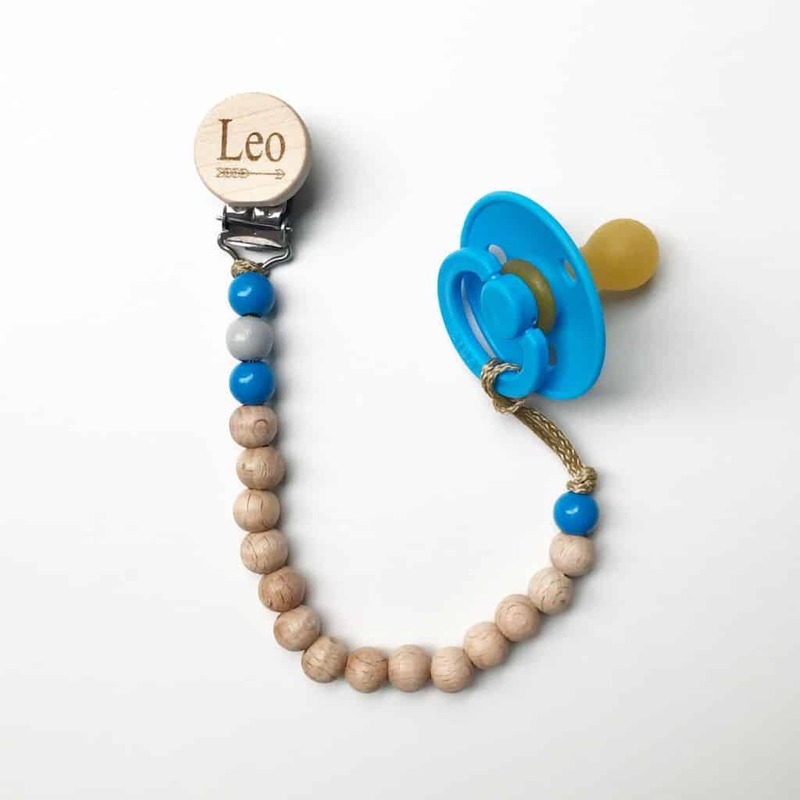 We use a strong nylon cord so you can safely attach a dummy to the end. 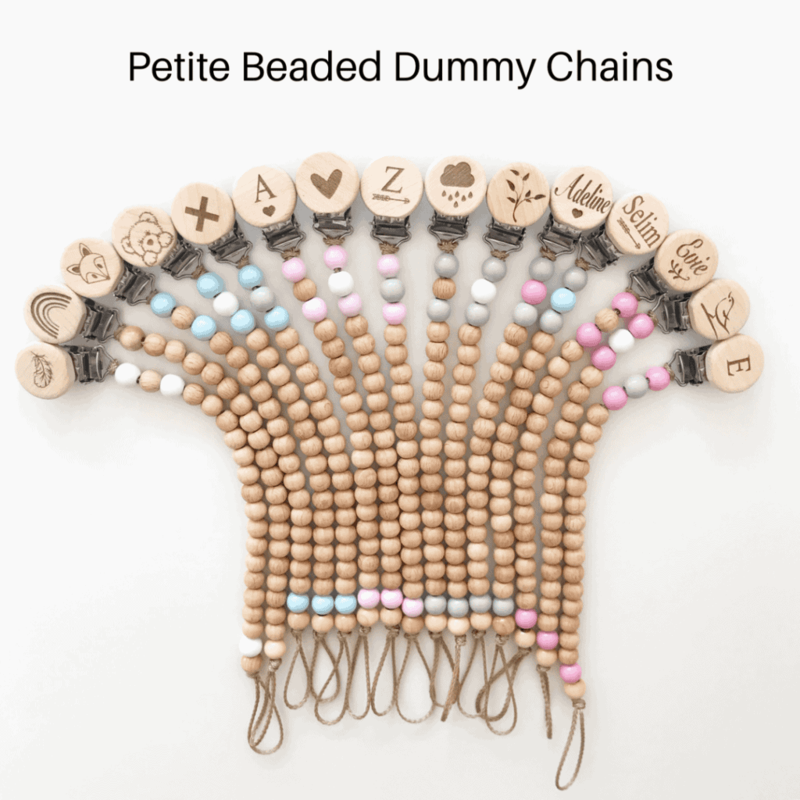 For our Petite bead dummy chains, we use beads that are approximately 1cm wide. 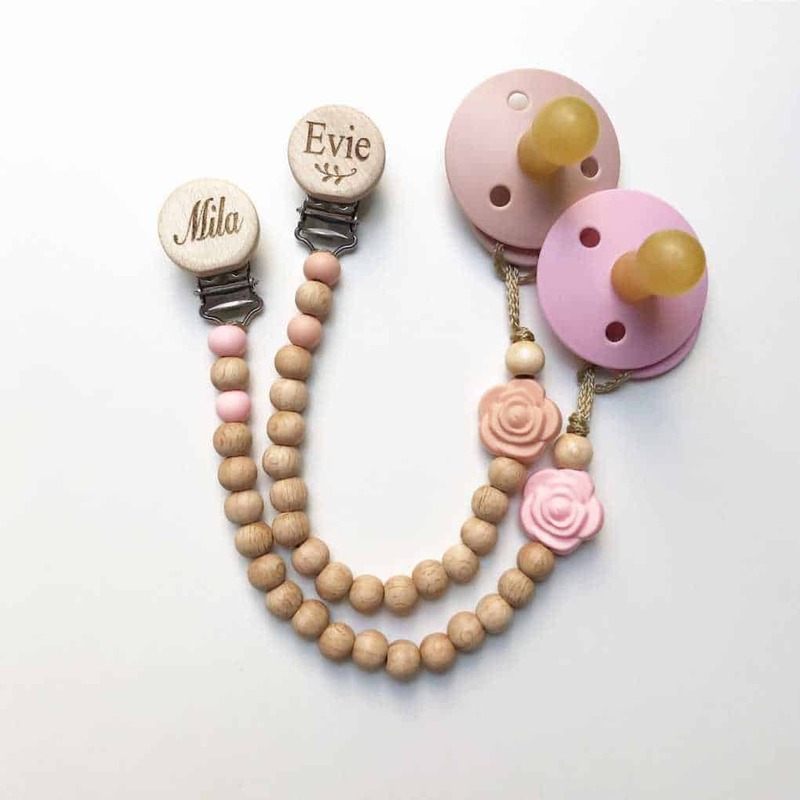 They are made using raw, painted and varnished wooden beads. 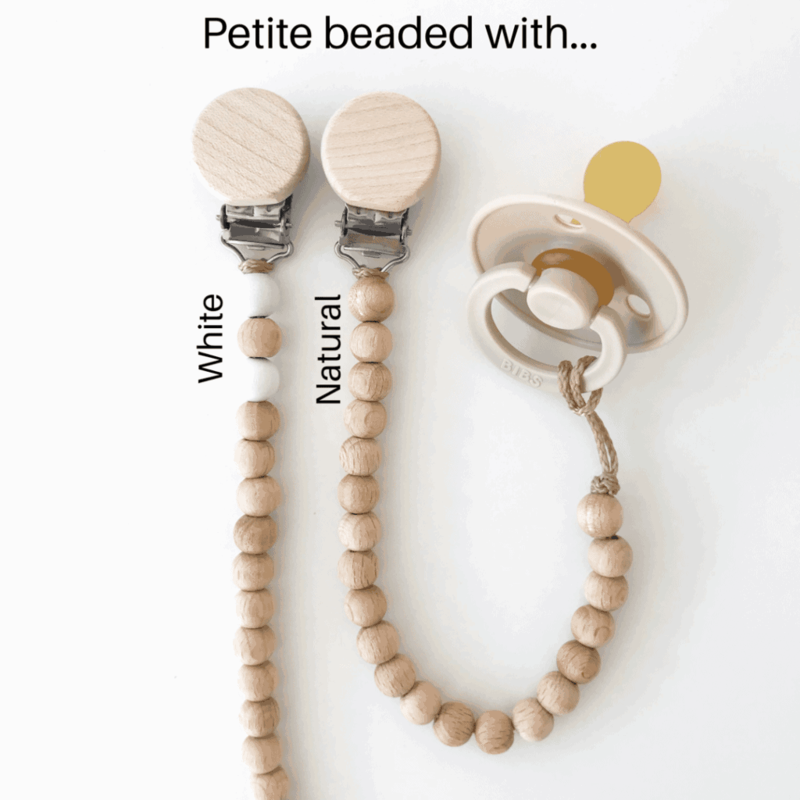 All of our wooden beads and bead dummy chains are made from non-toxic materials so they are safe for babies. 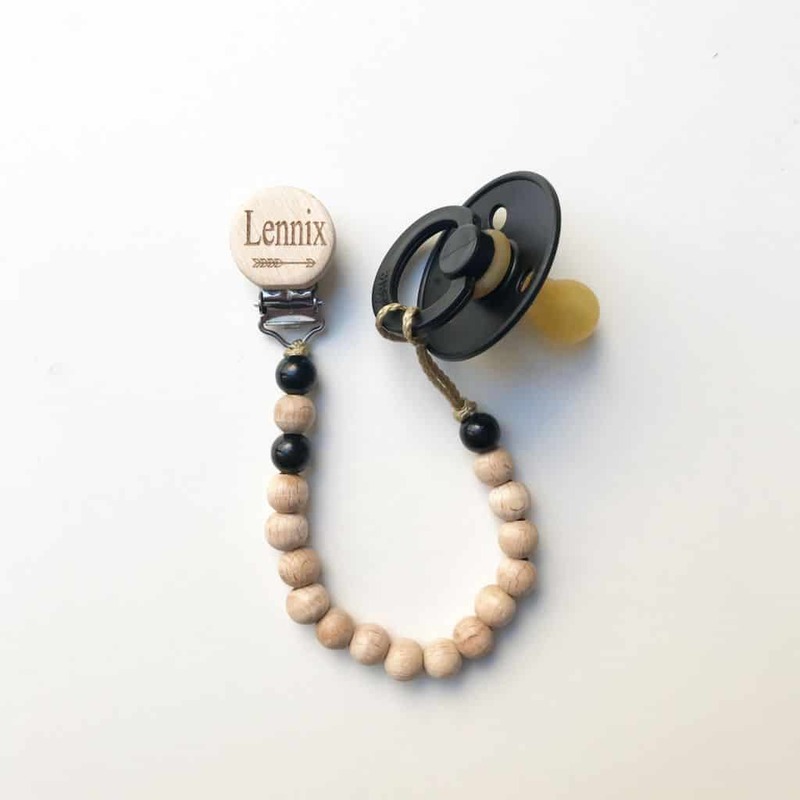 The petite bead dummy chain is lightweight and suitable for newborns and older children. 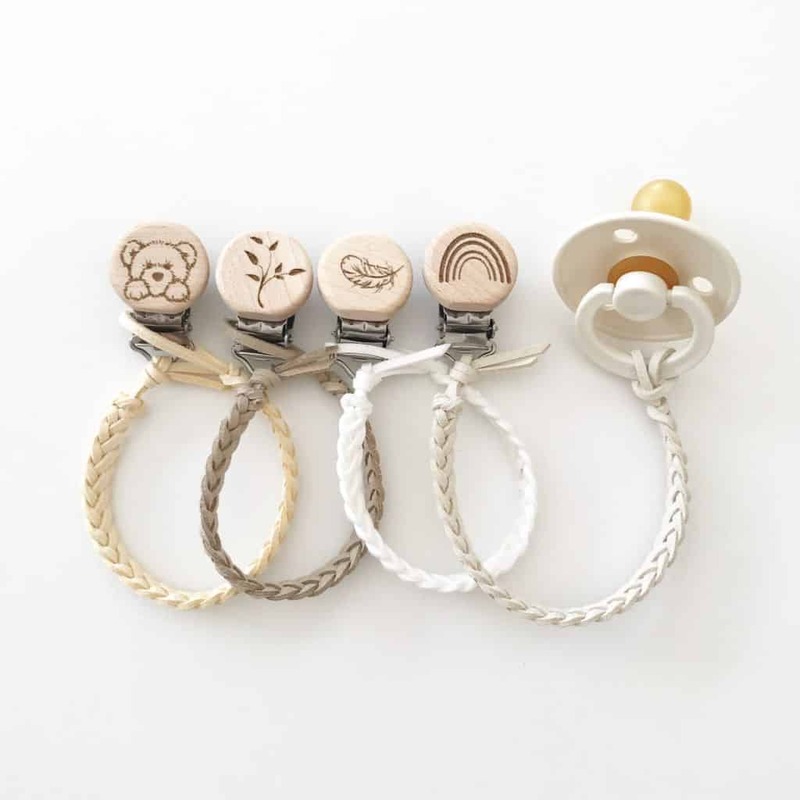 Our bead dummy chains are a beautiful accessory on baby onsie and will compliment your baby clothes without being overpowering. 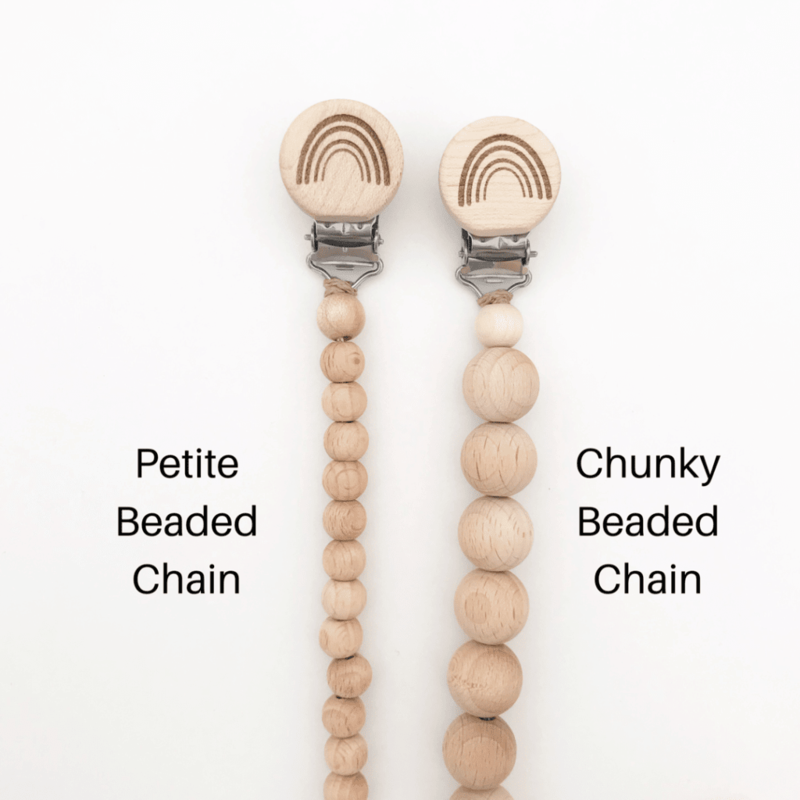 With our Chunky bead dummy chains, beads are approximately 1.5cm wide. 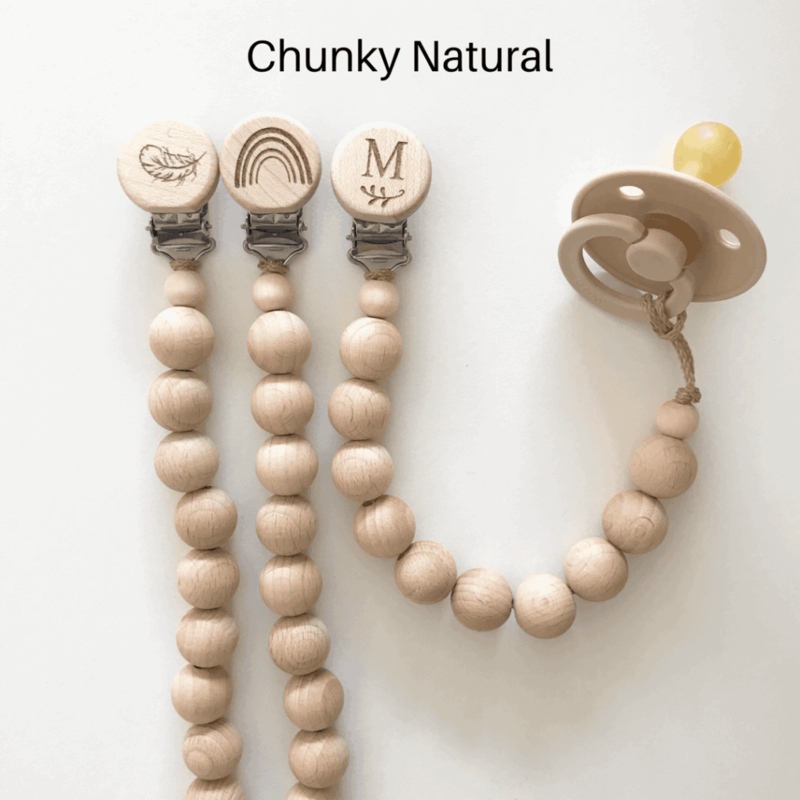 They are made of raw wooden beech wood, silicone coloured beads and a 1cm varnished wooden safety bead. 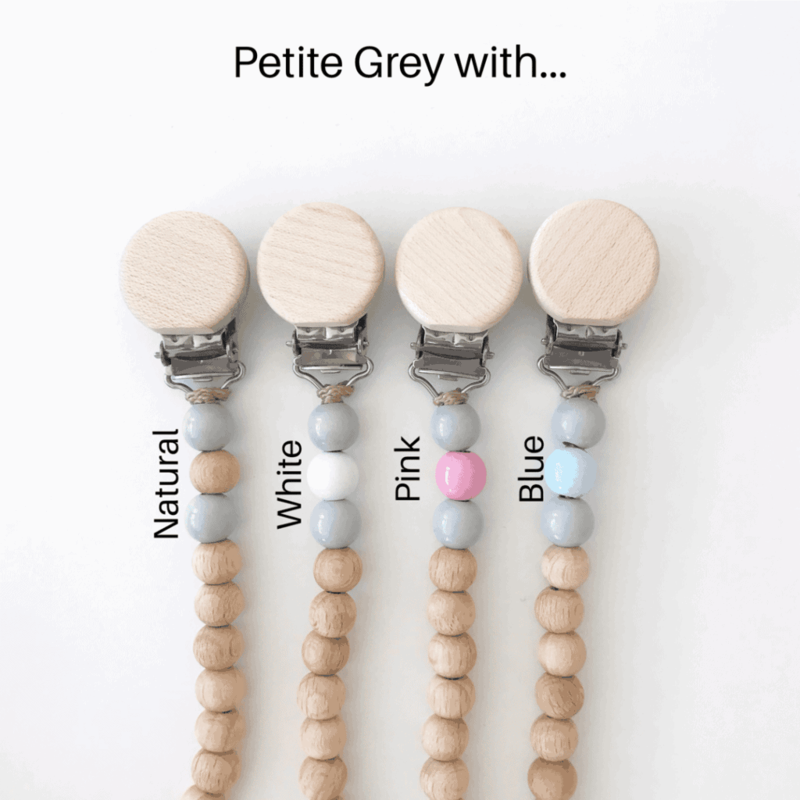 Our beads are made from non-toxic materials and food grade silicone and are safe for babies and children. 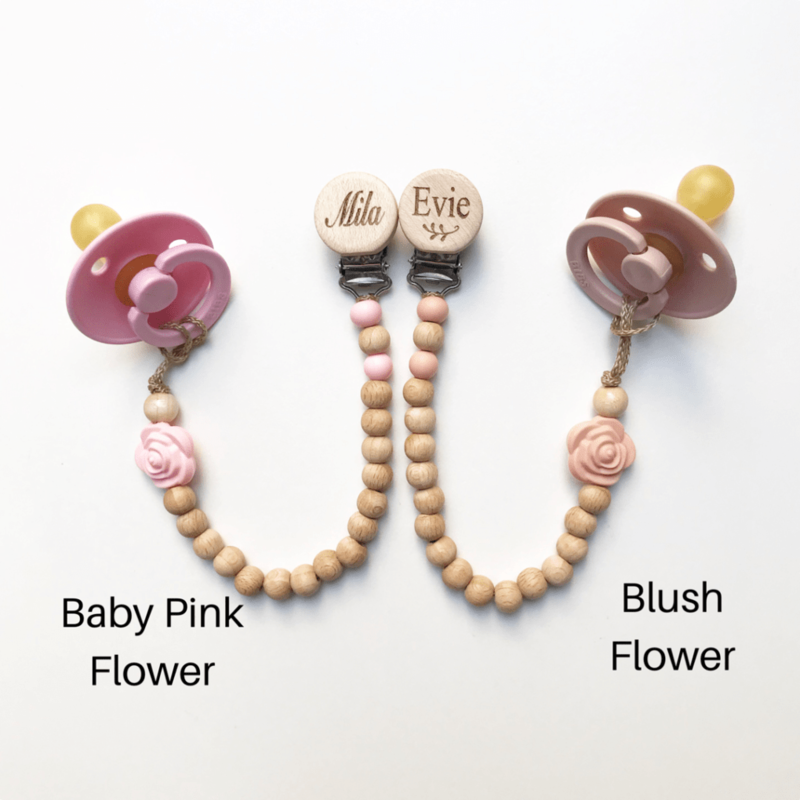 In both styles we also have a Flower dummy chain available in baby pink or blush. 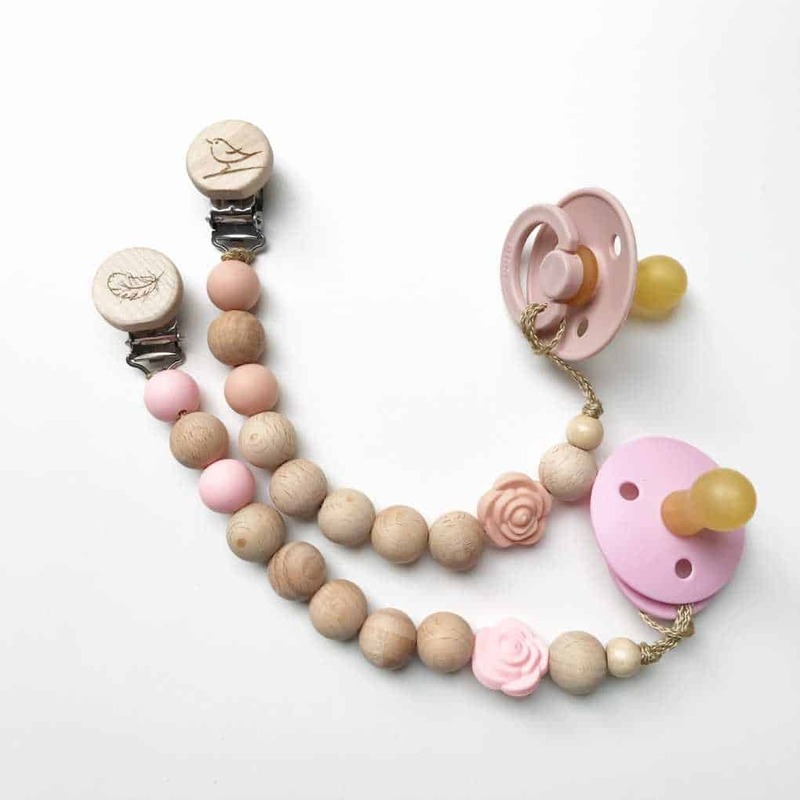 For this style we have included coloured silicone beads, raw beads and a silicone flower to match. 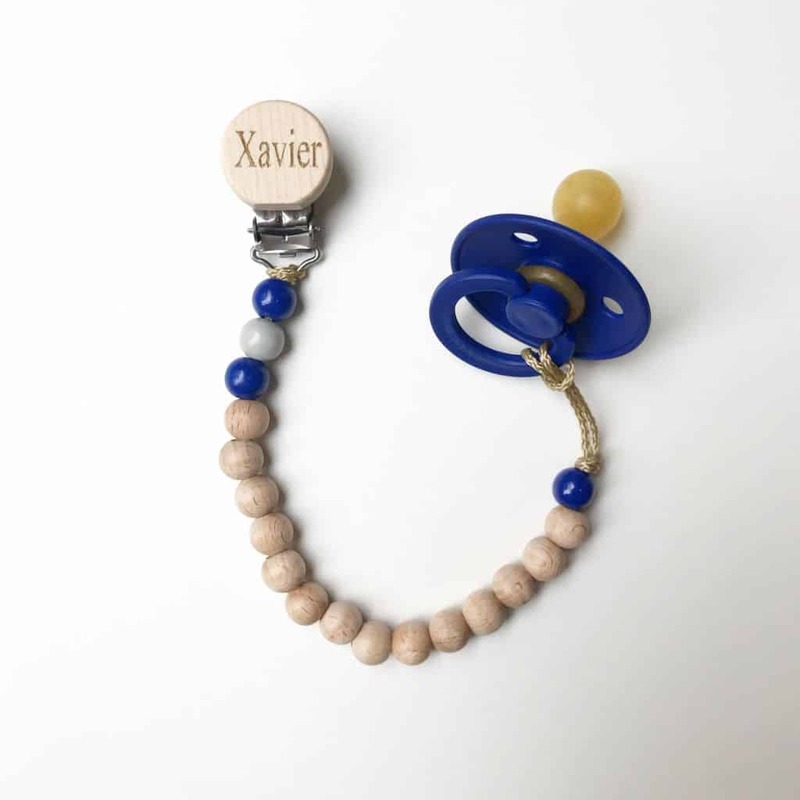 All of our personalised dummy chains can be matched with a BIBS colour dummy. If you would like help with matching your colours, email us and we can help. 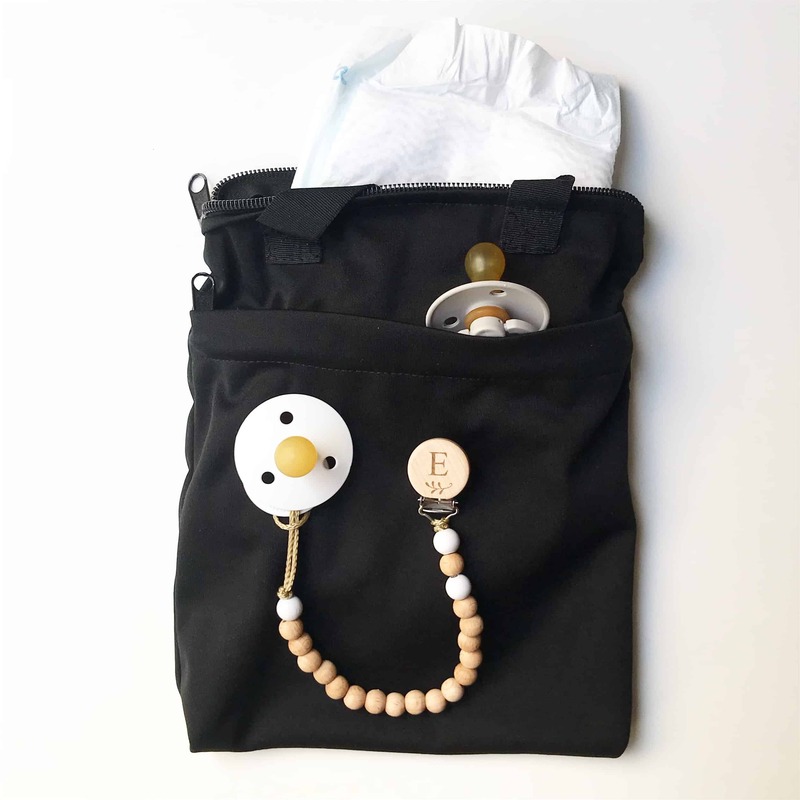 Our waterproof travel bags are brilliant for storing your personalised dummy chains and BIBS dummies. 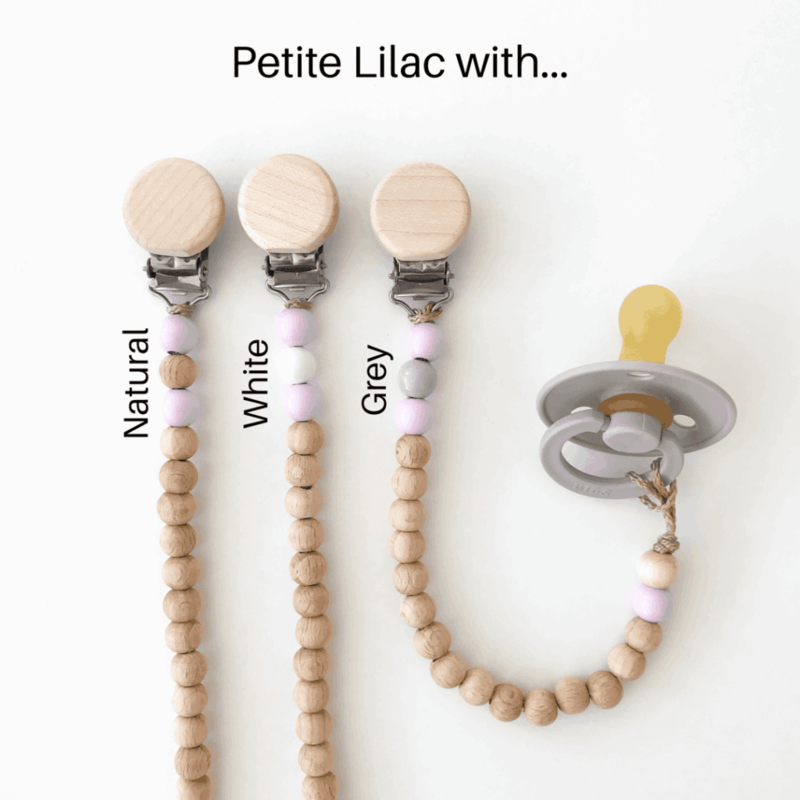 You can store anything essential for your nappy bag that you want to keep separate or clean. Each bag is lined with waterproof material so you can store wet products also. 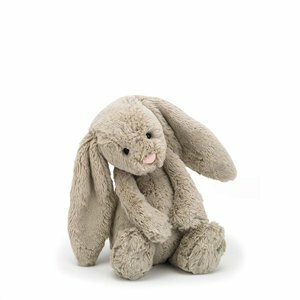 The bag is approximately 20cm x 25cm. So the bag is the perfect size to be carried or stored in your nappy bag, backpack, or under the pram. We made our bag with two pockets with zippers so you can keep things separated if needed. Our bag is available in stylish and gender-neutral black only. The colours will not run when machine-washed with your regular washing. 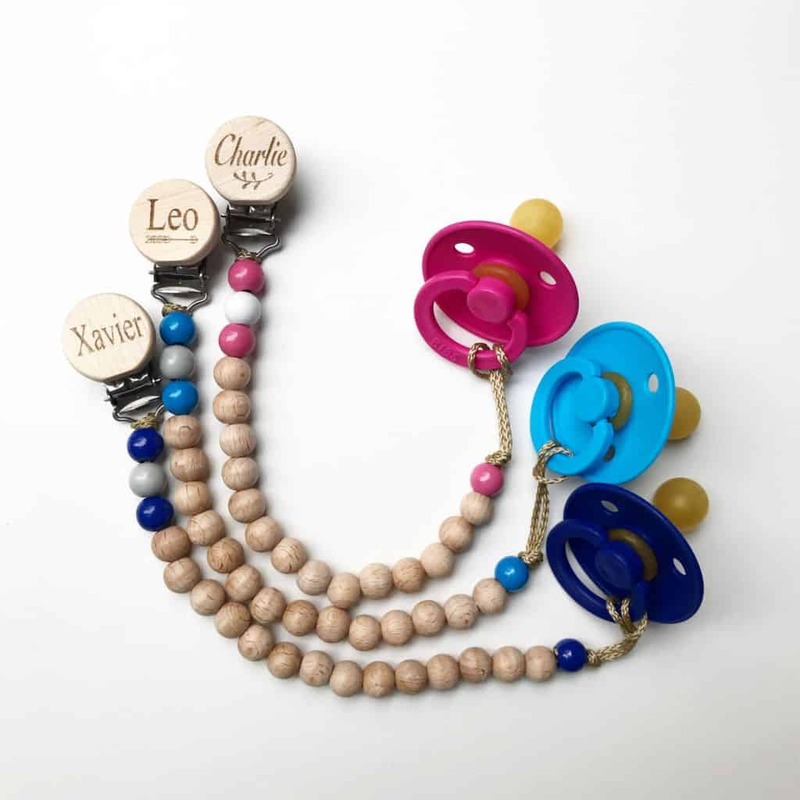 We will make and post your personalized dummy clips to you on a very spcific date. This date and information about the different parcel types can be found on our shipping page. so please read our shipping page before placing your order. Bettina is our our Chief bead dummy clip maker. She makes every single chain to absolute perfection and within the safty guidelines. Bettina is a Mumma to 3 beautiful babes aged 6,4 and 1. 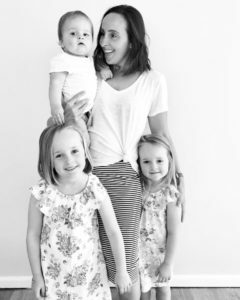 In a previous life before kids, she worked in marketing for magazines and television, but has been a stay at home mum raising her tribe of little people since her eldest was born. 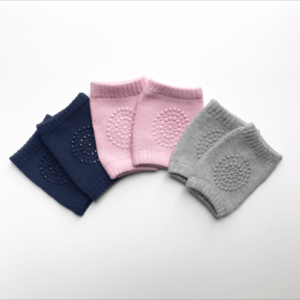 “Taking up the beading role with Our Little Helpers has been my first little step in getting a bit of something back that’s just for me, outside of being mum (and let’s be honest, their snack maid all day long!) 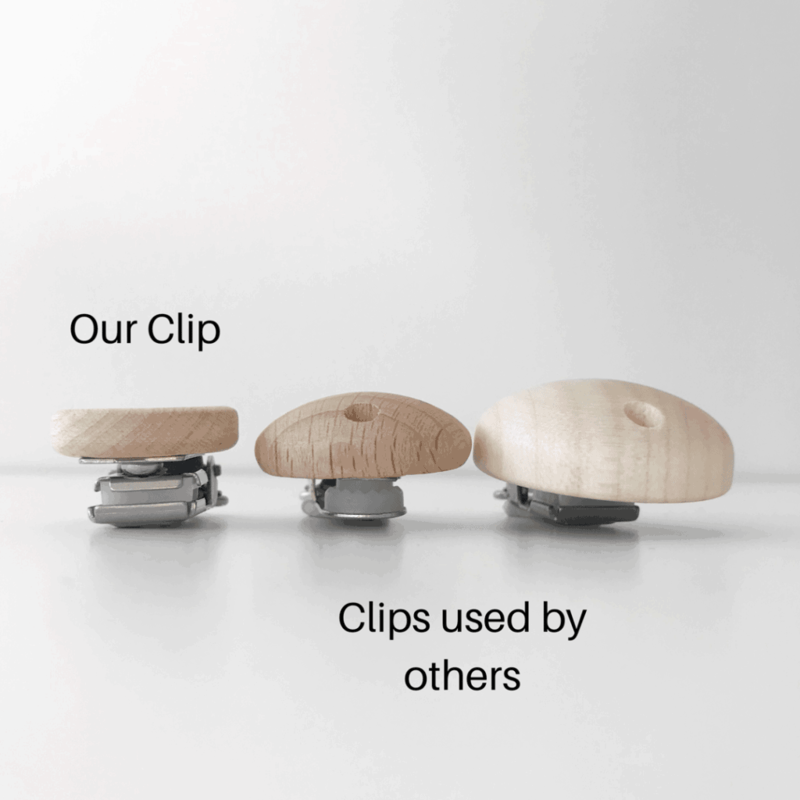 It’s so nice to have the opportunity to create these beautiful dummy clips. I’m one lucky gal to be a part of something so wonderful.” – Bettina. 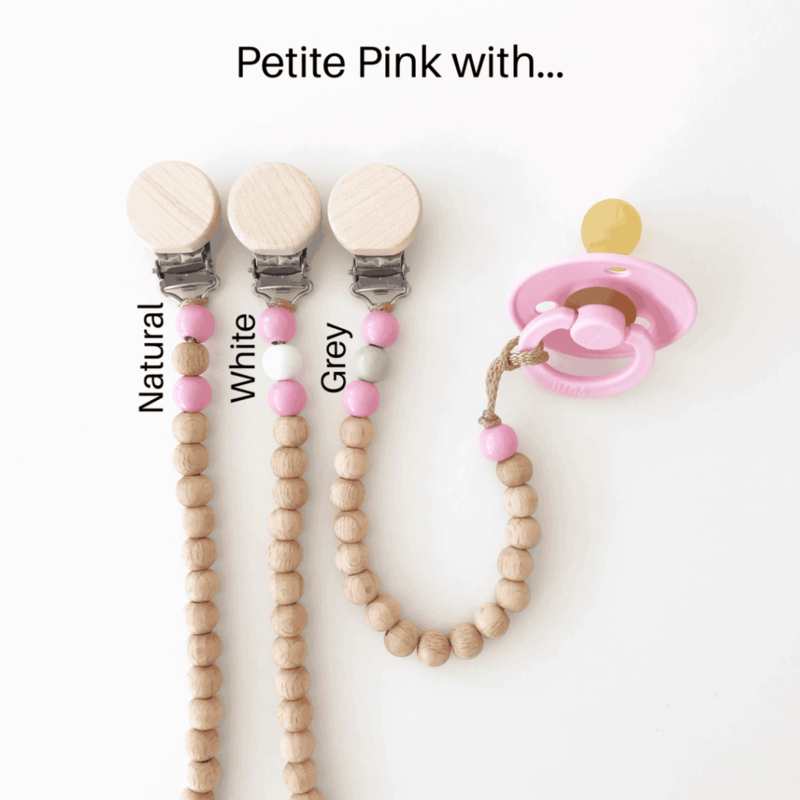 Absolutely in love with our new dummy clip! Gorgeous design and amazing quality. 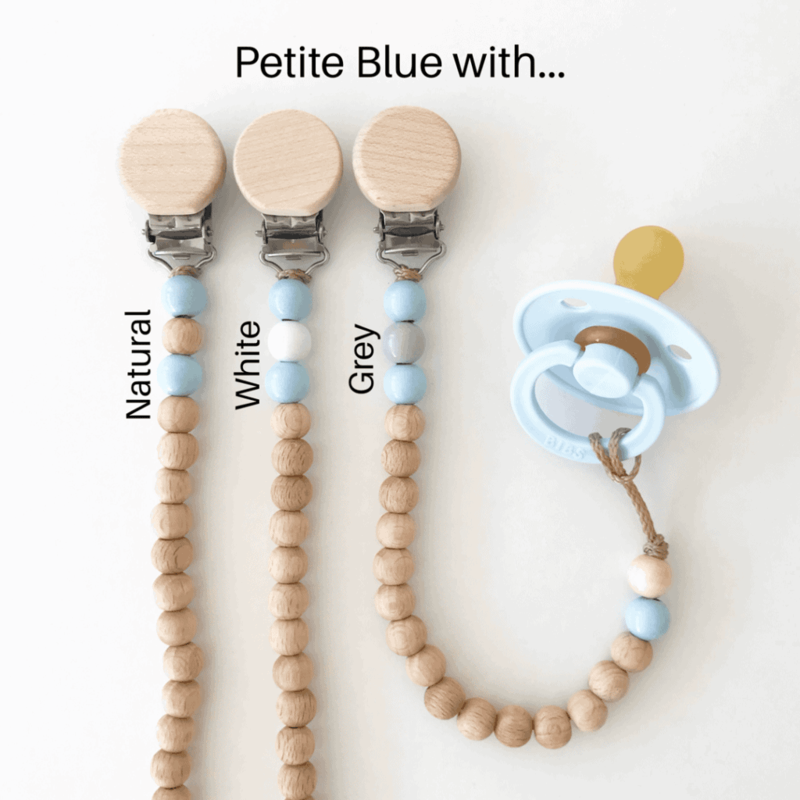 Can’t wait to use it on bub. Thanks so much!